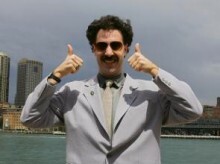 JERUSALEM — Like moviegoing masses around the world, Israelis have crowded theaters to watch the hit spoof Borat. But they are laughing for another reason: They actually understand what the anti-Semitic, misogynist Kazakh journalist is saying. The film is peppered with Hebrew expressions and Israeli slang, inside jokes only Israelis could truly appreciate. In one scene, Borat sings the lyrics of the legendary Hebrew folk song Koom Bachur Atzel, meaning “get up lazy boy.” Later, he refers to a Kazakh government scientist, “Dr. Yarmulke,” who proved that a woman’s brain is the size of a squirrel’s. Even Borat’s signature catch phrase — “Wa wa wee wa,” an expression for wow — derives from a skit on a popular Israeli comedy show and is often heard in Israel. Baron Cohen almost never appears in public out of character. His Los Angeles-based publicist declined several requests to interview Borat in English — or Hebrew. But by all accounts, Baron Cohen is the opposite of the anti-Semitic journalist he portrays.